Dr. Eisenmann of Lone Mountain Animal Hospital explains how to reduce you cats stress preparing for trips to the veterinarian’s office. Like humans, your cat requires annual trips to the doctor for check- ups and preventative care. However, it can be a challenge getting your furry feline to the veterinarian. Because they associate the carrier and journey with stress, most cats do not like coming to the clinic. There are ways to make the trip to the vet a less traumatic and happier experience for all. This patient is curious and cautious about approaching the cat carrier. Be patient! It may take your cat several days or weeks to become familiar and comfortable with her carrier. Place carrier in small room where there is not a lot of hiding places. Encourage your cat with treats and toys. If you’re still having trouble, you may remove the top portion of the carrier or open the top, and gently place the cat inside. In cases of multi-cat households, coming home from the veterinarian can be challenging as well. Cats smell different to other cats after being to the vet, which can create some tension in the household. 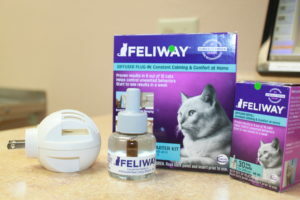 Try bringing the cats to the clinic together, since they will all smell like the clinic, it will decrease tension back home. Try to leave the cat in the carrier when you first arrive home for a minute or so for the others to sniff and get their bearings. If you sense the tension between the cats or have had previous issues, place the cat in another room for a few hours to a day with food, water, and litter. This will allow the cat to adjust and smell like home again. If all goes well and there is no tension, you can let the cat out of the carrier to go on with her day. The American Association of Feline Practitioners has a great website regarding cat care as well as tips and information on behavior, preventative care, introductions, adoptions and more. My wife and I recently got a kitten, but we have no experience with visiting a vet. I like that you suggest rewarding your car with treats when they use their carrier. I agree that this sounds like a great way to get her accommodated to it. Thanks for sharing. Thank you for all the tips on how to get your cat to the vet. My cat is terrified of going anywhere, but I really want to get them to the vet. I think that is a great idea to place her carrier in the room where she spends the most time and fill it with her favorite things. I think that would really help her get used to the carrier. I will have to give it a try! Thank you for mentioning how you should take the time to move slowly when taking your animal to the vet. It makes sense to think that if you move fast they may get agitated and stressed. Personally, I would want to make sure I find a vet that can work with the type of animal I have. Taking my cat to the vet has always been a stressful experience for both of us. I like your idea to keep the carrier around so they can grow accustomed to it. I might put my cat’s favorite toy in it too, just to give him an incentive to go in. I love my cat, and I want him to be happy. Thanks for the advice! Thanks for the tips about being calm for when I will take my cat to the vet. I thought that it would be best to get them in a cage before they run away. Now I see that being slowly taking them would be best. It’s time for me to find a veterinarian. Thanks for your tip to take your cat to the vet to get its check-ups. I also like how you said that sometimes it’s hard to get them there. My husband and I are looking for veterinary clinics that are cat will like going to. I like your comment on moving slowly and calmly when trying to get your cat into her cat carrier. My little kitty has always been terrified of vets and we just moved to a new area where I am going to have to find a new vet. Hopefully, I can find one that is going to be sensitive to my shy cat and give her the care she deserves. My brother has a new cat and it’s not eating nor drinking for a day now. It was explained here that when transporting the cat, we should move slowly because it can be tense or stressed. Furthermore, for best pet care, it’s highly recommended to go to trusted veterinarians.